We began development for Black & White Bushido in 2015. At the time all of us worked for Endemol Shine Group, a global content creator, producer and distributor you may know from shows like Black Mirror, MasterChef and Big Brother. Legends of Gaming Live, one of their live events in which gaming influencers come together for a competitive gaming tournament, approached us to create a competitive multiplayer game for them. 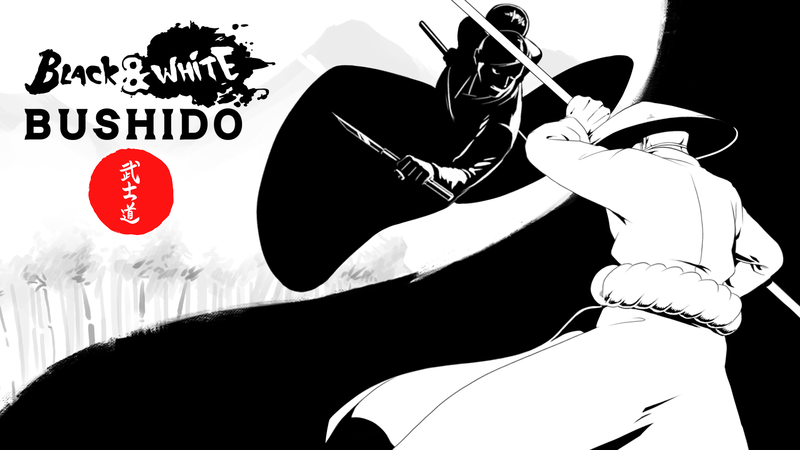 We have released Black & White Bushido on PC, PS4 and Xbox One. In autumn 2018 we will release the game on Nintendo Switch, but first we wanted to take a look at what went what we have learnt so far on our journey, what went right and what we would do differently. The concept we created was a couch brawler with a unique stealth twist. Black & White Bushido pits the forces of light and shadow against each other. Each team can disappear into their respective colours and move without being seen as they fight in DeathMatch or Capture the Flag mode. This stealth mechanic hadn’t been done in an arena brawler before. We created a prototype with the core mechanic, just cubes attacking each other in an arena with light and shadow areas, and we all fell in love with the game. That’s how we knew we had something good, because usually our taste in games is very different. We found something we were passionate about and we believe that’s the most important thing when choosing a project. Looking back, we could have done more research before choosing a genre, as this would have given us a better understanding of the audience for this game – something that we will touch on later when looking at what we could have done differently. 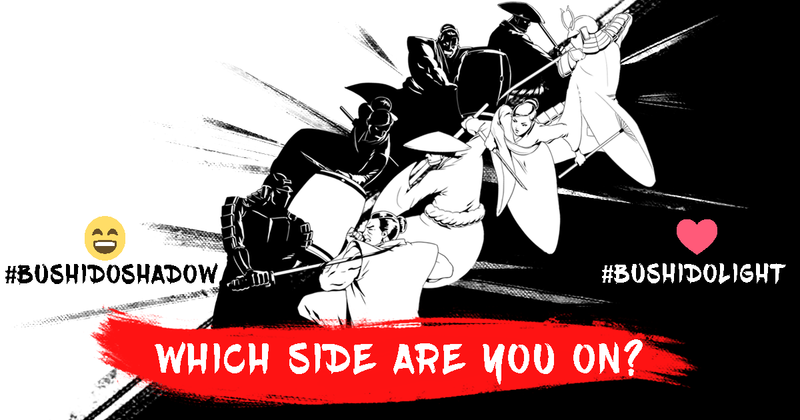 Black & White Bushido’s light vs shadow mechanic didn’t only add a nice twist to our brawler, it also inspired our game’s art style and marketing material. It was a great choice, because it made us stand out from other games in the market. We considered multiple themes for our game, including spies in an urban setting and abstract monsters or aliens, but we wanted to find something that explained the brawling and stealth mechanics. Ninjas and samurai made sense, they sneak around, jump across buildings and fight. We also found it improved the learning curve of the game, because the player expected these actions to be possible. We collaborated with a very talented artist, Tom Waterhouse, to make all of the artwork and it paid off well. Our artwork had a really positive impact on the first impressions of the game and the perceived quality. 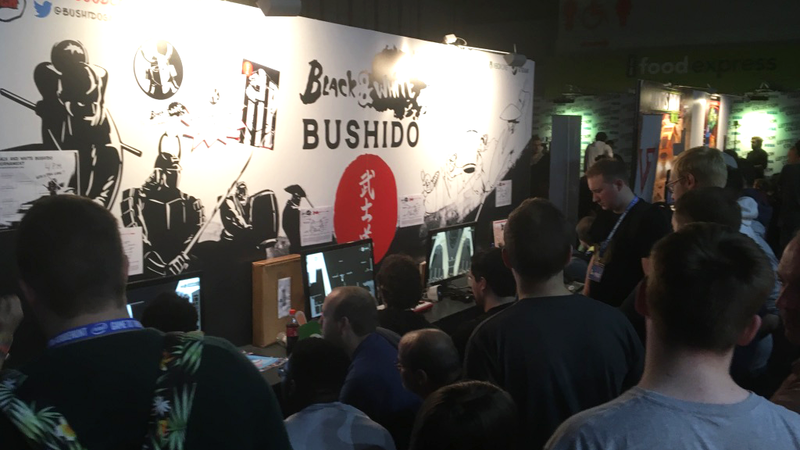 Our most successful marketing was taking Black & White Bushido to game conventions. EGX 2015 in Birmingham was our first show, just before our Steam launch. We were nervous because we invested a lot of money into our stand and worried people wouldn’t like our game. By the end we had made the top 5 best indie games at EGX list! Our booth was constantly full and very lively. The game naturally attracted a lot of people and we made sure to engage with everyone who walked by and invited them to try the game. We played the game with them to demonstrate the multiplayer experience and we organised daily tournaments with prizes which encouraged a lot of people to return to our booth. Going to shows had a lot of benefits for us. Firstly, we got a better understanding of our target audience by looking at the type of people who enjoyed our game and how they were playing. The second benefit was receiving feedback. People gave us a lot of good suggestions, for example, to add a button which reveals your position in stealth if you lose track of your character. And even just watching them play revealed a lot. If they were laughing they were enjoying it, if they were staring at the screen, something was confusing them so we took note of that. That first show is also where we noticed how much Black & White Bushido brought out the competitiveness in people, and it inspired the friendship breaker theme we used in our marketing. Another invaluable benefit was making new contacts in the industry. We tried to meet as many people as possible to explore taking Black & White Bushido to the next level. Anil met an Xbox contact and brought him to our booth to try the game. He liked it enough to convince us to make a version for the Xbox One and Playstation consoles. We knew we had a great game and were well received at shows, but we felt we needed to get the game out quickly to capitalise on the interest we were getting. We knew the Steam greenlight process could take a long time, so we partnered with Green Man Gaming which allowed us to skip greenlight and they also helped us publicise the game. There is no doubt this was the right decision for us. As mentioned earlier Black & White Bushido was a passion project, but looking back we could have done more research. From a business perspective, a local multiplayer brawler perhaps wasn’t the best choice. Given that it’s a niche genre, the target audience is relatively small and our initial sales numbers were lower than projected. However, the experience we gained was invaluable and allowed us to start our own studio. We also should have done more research on the game’s name, Black & White Bushido. Although descriptive, it is too long, and adding an ampersand complicates search results and can make finding our game tricky. 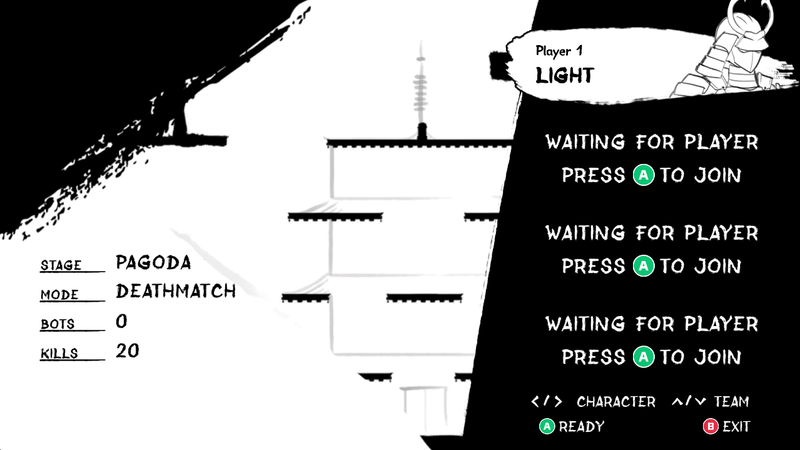 Black & White Bushido is a great local multiplayer brawler. Its strength lies in playing with your friends on the couch and experiencing the moment. That’s how it was originally designed. However, we received a lot of feedback to add online multiplayer to our game and we decided to add it for our console launch. The development process for this took much longer than we had anticipated and we had several rounds of QA before getting certification on PlayStation and Xbox. This had a significant impact on our budget which we hadn’t originally planned for. Having gone through the painstaking task of getting online multiplayer up and running, we didn’t have as many active players as we had hoped which were needed to keep the servers active and well populated. In hindsight we should have compared the sales numbers of successful multiplayer games to get an idea of how large our player base needed to be. We made the classic beginner’s mistake of waiting too long with marketing. Aside from taking it to shows we didn’t do enough marketing prelaunch to build hype around the game. We did get press coverage for launch and worked with a great agency to help us, but in future, we would want to bring all the press and marketing elements together to generate awareness both at launch, and also in the lead-up. For our console launch we did some influencer marketing to help raise awareness. Our biggest learning was that by working with a number of smaller influencers, who’s audiences fit well with the game’s audience, proved much more valuable than spending all your budget on one big name. Our console marketing also struggled with losing momentum following the Steam launch, as the development was over a year. Publications didn’t necessarily want to cover our game again and we had exhibited at most of the key shows already. What did work well for us was our pricing and sales strategy. We made sure that our pricing gave us leeway to participate in sales without cutting into our margin. Since launch we have tried to be part of every relevant platform sale and have seen an impressive spike each time. 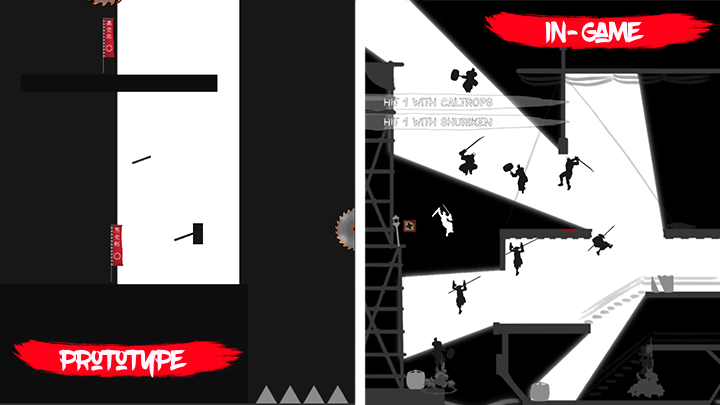 Our journey so far with Black & White Bushido has been full of highs and lows! We have gained so much knowledge from the experience and are applying all our learnings to our Nintendo Switch launch. We’re keeping our development cycle short to keep the budget reasonable. And we now have a full marketing plan and team in place, to raise awareness for our Switch release. 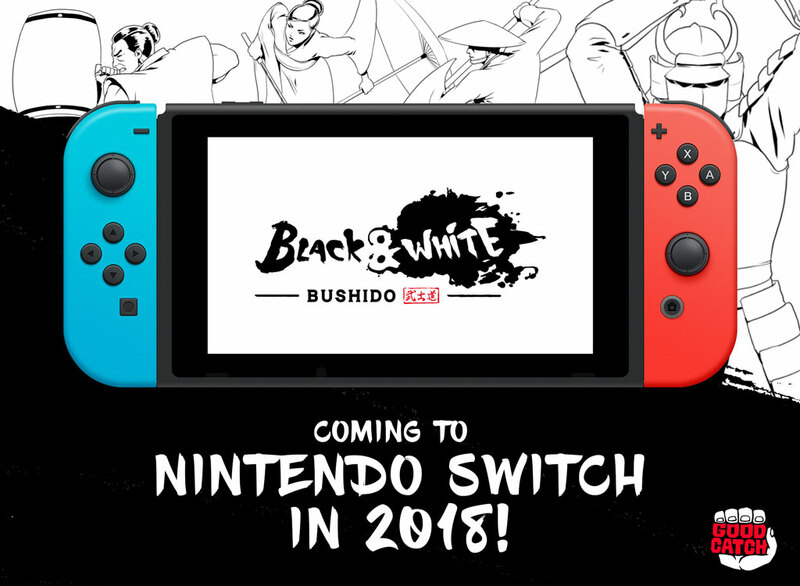 We are taking Black & White Bushido back to its core, a local multiplayer, fun and addictive couch brawler, which fits perfectly with the Nintendo Switch console. Keep an eye out, this won’t be the last you hear of Black & White Bushido!